LoveLula.com: Skin Blossom Special Offer - Cleanser & Moisturiser for only £10! Skin Blossom Special Offer - Cleanser & Moisturiser for only £10! Here at LoveLula.com we are all aware that these are certainly challenging economic times but we refuse to compromise on the natural quality of the products that we like to use! And we don’t expect our customers to either which is why we’ve put together this fantastic offer especially for you! Perfect for younger skins due to it’s simplicity and great for more mature skins too; You can feel the Nourishing Face Moisturiser start to firm and plump the skin immediately! This dashing duo comprises of the Gentle Cleansing Milk and the Nourishing Face Moisturiser. The perfect, natural and simple treat for your skin. The Gentle Cleansing Milk is nutrient rich milk that gently cleanses skin and removes makeup to leave it soft and comforted and contains an antioxidant blend of vitamins and minerals to nurture and revitalise. 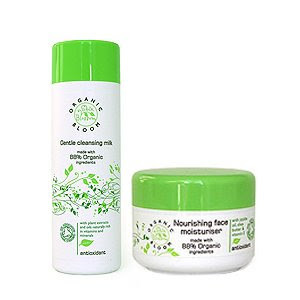 Follow this with the lovely Nourishing Face Moisturiser which is an antioxidant moisturising cream that hydrates and nourishes, conditions and protects delicate skin. So, if you are seeking safe, effective and affordable skincare, then you are in the right place. The Skin Blossom Organic Bloom Range has been specially created to contain organic and skin-friendly ingredients; it is certified by the Soil Association and registered with the Vegan Society.